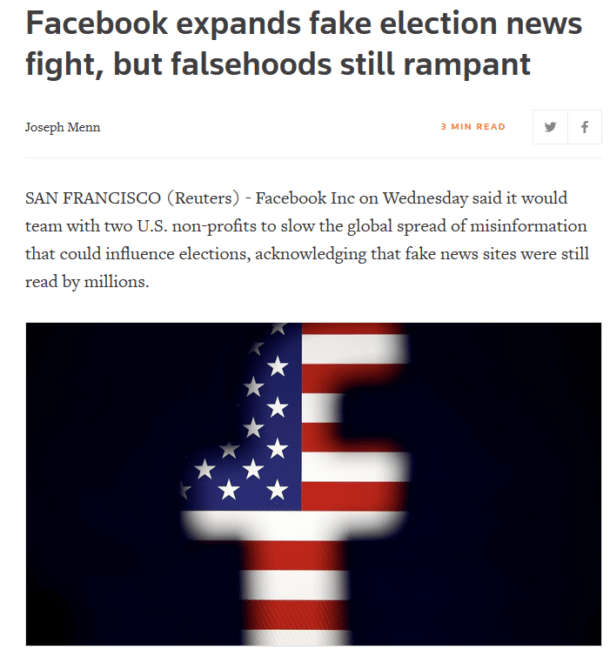 Media giant Facebook recently announced (Reuters, 9/19/18) it would combat “fake news” by partnering with two propaganda organizations founded and funded by the U.S. government: the National Democratic Institute (NDI) and the International Republican Institute (IRI). The social media platform was already working closely with the NATO-sponsored Atlantic Council think tank (FAIR.org, 5/21/18). The Washington, DC–based NDI and IRI are staffed with senior Democratic and Republican politicians; the NDI is chaired by former Secretary of State Madeleine Albright, while the late Sen. John McCain was the longtime IRI chair. Both groups were created in 1983 as arms of the National Endowment for Democracy (NED), a Cold War enterprise backed by then–CIA director William Casey (Jacobin, 3/7/18). 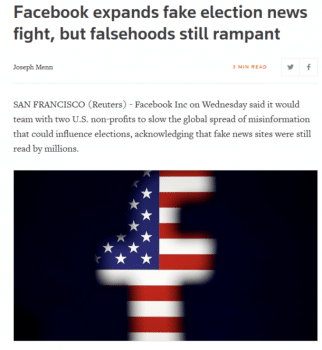 That these two U.S. government creations, along with a NATO offshoot like the Atlantic Council, are used by Facebook to distinguish real from fake news is effectively state censorship. Served as a bridge between the nation’s political parties and all civil society groups to help Venezuelans forge a new democratic future….We stand ready to continue our partnership with the courageous Venezuelan people. The Reuters report (9/19/18) mentioned that Facebook was anxious to better curate what Brazilians saw on their feeds in the run-up to their presidential elections, which pits far-right Jair Bolsonaro against leftist Fernando Haddad. The U.S. government has a long history of undermining democracy in Brazil, from supporting a coup in 1964 against the progressive Goulart administration to continually spying on leftist President Dilma Rousseff (BBC, 7/4/15) in the run-up to the parliamentary coup against her in 2016 (CounterSpin, 6/2/17). 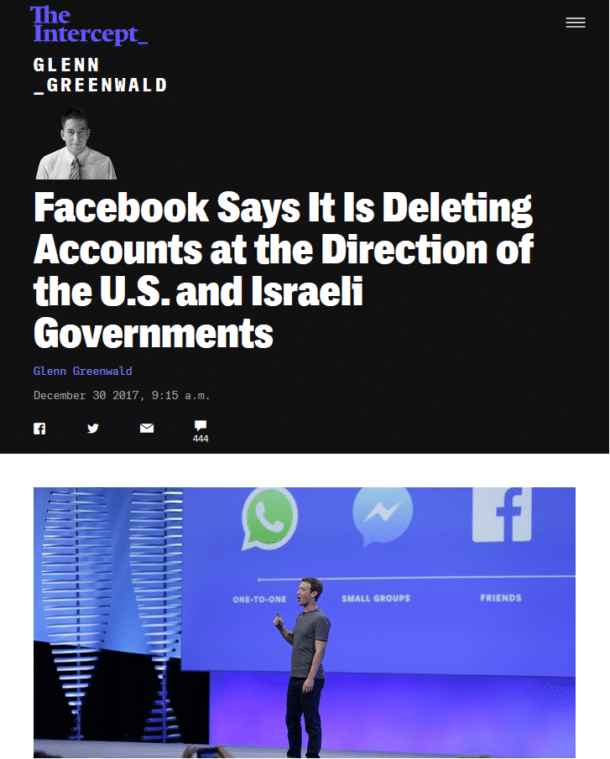 Soon after it partnered with the Atlantic Council, Facebook moved to delete accounts and pages connected with Iranian broadcasting channels (CNBC, 8/23/18), while The Intercept (12/30/17) reported that in 2017 the social media platform met with Israeli government officials to discuss which Palestinian voices it should censor. Ninety-five percent of Israeli government requests for deletion were granted. 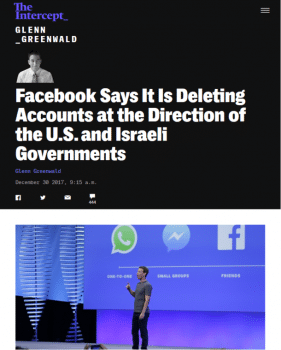 Thus the U.S. government and its allies are effectively using the platform to silence dissenting opinion, both at home and on the world stage, controlling what Facebook‘s 2 billion users see and do not see. Progressives should be deeply skeptical that these moves have anything to do with their stated objective of promoting democracy. Bloomberg Businessweek (9/29/17) reported that the far-right Alternative fur Deutschland (AfD) party went to Facebook headquarters for discussions with U.S. companies about how it could use the platform for recruitment and micro-targeting in the 2017 elections. AfD tripled its previous vote share, becoming the third-largest party in Germany, the far right’s best showing since World War II. Public trust in government is at 18 percent—an all-time low (Pew, 12/14/17). There is similar mistrust of Facebook, with only 20 percent of Americans agreeing social media sites do a good job separating fact from fiction. And yet, worldwide, Facebook is a crucial news source. Fifty-two percent of Brazilians, 61 percent of Mexicans, and 51 percent of Italians and Turks use the platform for news; 39 percent of the U.S. gets their news from the site. This means that, despite the fact that even its own public mistrusts it, the U.S. government has effectively become the arbiter of what the world sees and hears, with the ability to marginalize or simply delete news from organizations or countries that do not share its opinions. This power could be used at sensitive times, like elections. This is not an idle threat. The U.S. created an entire fake social network for Cubans that aimed to stir unrest and overthrow the Cuban government, according to the Guardian (4/3/14). That a single corporation has such a monopoly over the flow of worldwide news is already problematic, but the increasing meshing of corporate and U.S. government control over the means of communication is particularly worrying. 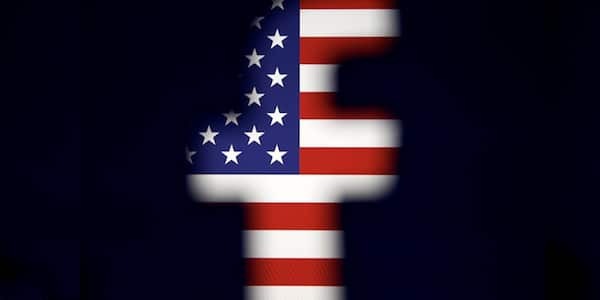 All those who believe in free and open exchange of information should oppose Facebook becoming a tool of U.S. foreign policy.